Chinese electronics giant Huawei’s founder and CEO Ren Zhengfei’s daughter and Huawei Chief Financial Officer Meng Wanzhou, has been arrested in Vancouver, Canada, over allegations that the company contravened U.S. sanctions on Iran. Meng could be extradited to the United States, which would elevate the already tense trade stand-off between China and the United States. Huawei, its chief rival ZTE and several other companies saw stock losses as the Hang Seng China Enterprises Index dropped 2.76% shortly after the news of the arrest broke. Chinese stocks have already been on a downward path ever since U.S. tariffs on Chinese imports were enforced, and the situation with Huawei’s CEO isn’t going to help. 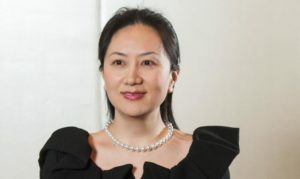 The biggest fear now is that Huawei could be looking at a ban similar to what was brought against ZTE last year for trade sanction violations in North Korea and Iran. Will Huawei face the same punishment as ZTE? If it does, it will further aggravate the Chinese government and could have negative repercussions on the delicate trade balance that is already being buffeted by stringent initiatives from both governments.